Lawmakers and bureaucrats in official Washington often act as if their decisions lead the nation forward. News from Iowa this week, however, shows once again that the culture leads and politicians lag behind. 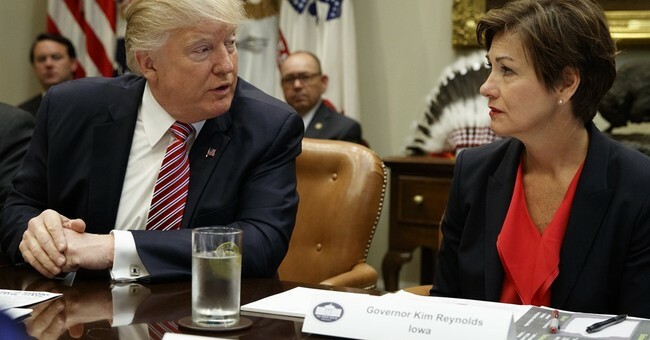 Kim Reynolds became Iowa's Governor last May when her predecessor (Terry Branstad) resigned to serve as the U.S. Ambassador to China. Reynolds is now running for her own full term in a state where the average Obamacare premiums jumped 57 percent. "Many Iowans faced a choice of going broke or going without insurance," according to Reynolds. "And that's really not a real choice." Seizing the opportunity to solve a problem during an election year, Reynolds signed a bill allowing the Iowa Farm Bureau to offer "health benefit plans" that aren't covered by the Obamacare regulations. Most significantly, the law will give Iowa residents more choice in the amount of insurance they want to buy. In purely economic terms, this directly addresses a core reason that insurance prices have jumped so high. The Obamacare regulations mandated that all insurance policies must cover all kinds of medical conditions. Insurance companies loved that one-size-fits-all approach because it forced many people to buy more insurance than they needed or wanted. For consumers, though, the result of those regulations was sticker shock. An Iowa woman who watched the Governor sign the new law observed "there's no reason a healthy 32-year-old should be paying more for health insurance than for her mortgage." Because of Iowa's new law, she will now have a choice between lower premiums for a basic level of insurance and higher premiums for more comprehensive coverage. The enduring resistance to Obamacare mandates stems from the fact that the law clashed with one of America's deepest values and cultural traditions. Americans overwhelmingly believe that we have the right to live our own life as we choose, so long as we respect the rights of others to do the same. That core belief is the reason Obamacare's individual mandate -- a requirement forcing people to buy a specific type of insurance -- was so unpopular. Fifteen million Americans said they would drop the insurance coverage if they were allowed to do so. Another six million paid a fine rather than sign up. These people received a little relief late last year when Republicans in Congress repealed the individual mandate. However, they are still saddled with other mandates requiring insurance companies to sell only the most expensive and comprehensive plans. The states are taking the lead in addressing that problem. Earlier this year, Idaho passed a law explicitly authorizing insurance companies to sell more basic insurance plans with lower premiums. That effort has encountered strong resistance from the federal government. Iowa has taken a different approach to achieve the same objective. Governor Reynolds and her team found a loophole in the law and are taking advantage of it. It's likely that many other states will try similar approaches as they search for ways to serve their residents. The important thing about this development, however, is not the cleverness of the Iowa Governor. It's about America's cultural rejection of the idea that bureaucrats know best. Our cultural commitment to freedom will keep driving the process forward and giving individual Americans more control of their own health care choices.